As I outlined in one of my market reports last week, there seems to be a slight disconnect between silver prices and gold prices at present, with silver edging ever higher (albeit weakly), whilst gold prices appear to have and moved sideways with an ever increasing sign of weakness in the daily chart. Yesterday’s price action was no different, with silver closing the trading session higher once again with a relatively wide spread up bar, closing marginally above both the 40 day moving average, and the psychological $14 per ounce price level once again. 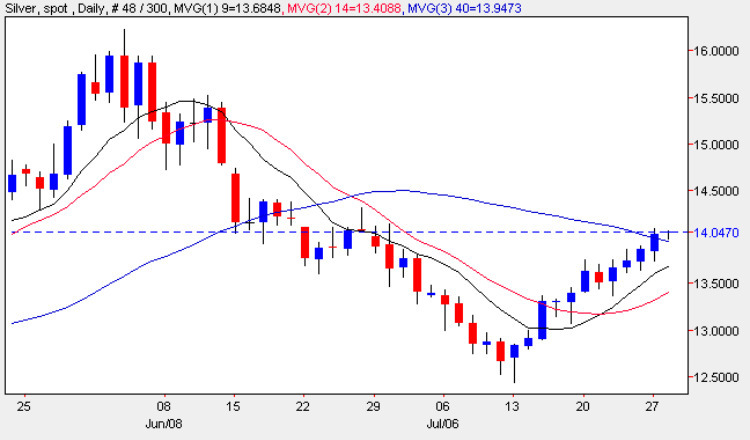 With the price of silver now battling its way through some heavy congestion in the $14 to $14.50 price region, any technical weakness could result in a very sharp reversal, and therefore for the move to be confirmed we need to see a break and hold above the $14.50 price level, coupled with some ‘clear-water’ to the downside on the 40 day moving average. My main concern at present however remains the gold chart, generally a good barometer of commodity prices and, in particular silver, which from a technical perspective is now starting to look increasingly weak – so we need to trade with care in spot silver!